This is where I note my efforts as I try to recreate some old recipes. 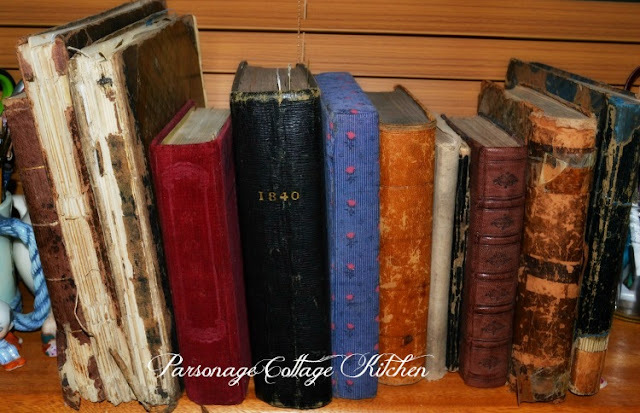 Most are taken from my small collection of handwritten recipe books which date from the late 1700's to around 1922. I also have a collection of old tatty old recipe books, well thumbed and heavily splashed from years of use. I love them all! The old-fashioned very stylised handwriting writing is sometimes difficult to decipher, measurements and cooking instructions are minimal, no tin sizes given. Luckily I enjoy a challenge. Just to complicate things I cook and bake on my wood-fired Rayburn, which can be... unpredictable. 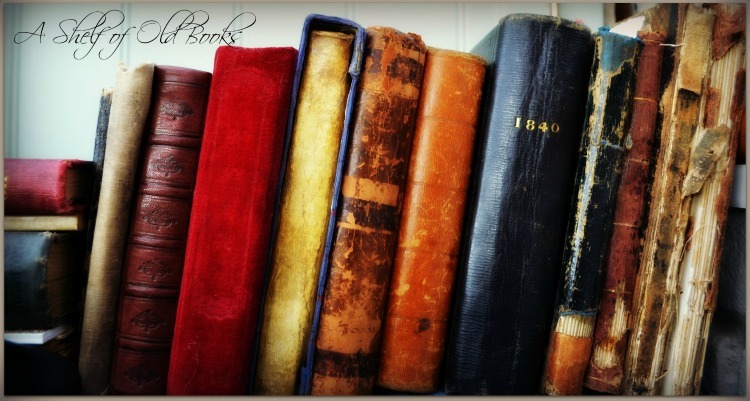 I suspect this blog is less about the food and more about my passion for these lovely old books and the wonderful women who wrote them. One of the problems about getting so involved with these m/s recipe books is that I feel as though I almost know the women who wrote them. I can see how they start out so enthusiastically using their best handwriting, etc. Recipes abound, interspersed with recipes for soothing babies suffering from wind, croup and the like, as well as how to treat sore breasts - presumably from breastfeeding. Over the many pages the handwriting slowly changes and evolves, often becoming shakier, entries dwindle. The tan-coloured book (right next to the blue) has a high quality binding and extremely beautiful handwriting within. It was begun in 1851 and was used for many hundreds of recipes and receipts, then in 1917 it was briefly used for a few dozen entries by someone else. The entry which caught my eye today, was the penultimate one entered by the original owner, C Cooper. It always makes me think of my mother, she died about 25 years ago, from stomach cancer. It seemed a particularly cruel fate for someone who really enjoyed her food, to go. Plum Pudding, Christmas Pudding, call it what you will, we never eat it on Christmas Day, we simply don't have the stamina these days. There is, of course, the perennial question of what to serve with your Plum Pudding, our preference is for custard, but I know a lot of people prefer brandy butter, cream, or even rum sauce. Rich and heavy pudding made even richer? No thank you, I'll stick to a well made custard sauce, our digestions can cope with that, but each to their own. One of my old handwritten recipe books gives this recipe, dated December 1862, a note says that it was given by Lady Cagley's Cook. Beat a 1/4 lb butter to a cream then add by degrees 3 oz of very fine loaf sugar. When well beaten add 1 glass of wine and 1 of brandy. It should be sent up in a boat and should look like thick whipped cream. Sounds like a version of Brandy butter to me. The same book gives a recipe for Christmas Puddings - vast quantities of them. 1 oz candied peel I wonder whether this was supposed to be 1 lb? Boiled for 9 1/2 hours in basins. Why such a large quantity? Well this was a vicarage cook and my did they know how to feed large numbers of people. The above quantities were more than sufficient with regard to Meat and Pudding. Bread, Tea, Sugar and Cream just about right. 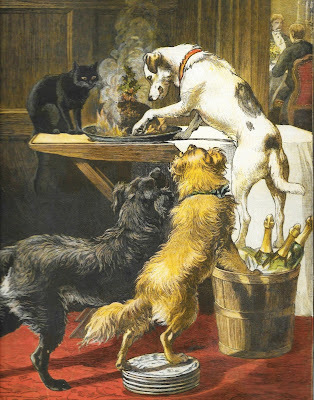 The book was written by a cook at a vicarage. Luckily for me, the name of the parish is mentioned once, so by the magic of internet and sheer curiosity, I have managed to find some photographs of the vicarage in question as it is presently up for sale. It is a big old place with enormous rooms, Grade II listed. It gave me quite a thrill to be able to look at photographs of the old kitchen and dining room where the writing, cooking and eating took place, way back in 1848! As this is my 'kitchen' blog, here are some of my new books. They are all rather battered and worn with not a single high-gloss photograph between them. Exactly the kind of recipe book I love. They are not as old as some, the oldest one dates to 1930's, but the recipes within are much older. Some have hand written notes, splashes and splodges, which all add to the charm, in my opinion. Before Christmas I bought a copy of Nigel Slater's new book, The Christmas Chronicles. I have flicked through it and no doubt it is an excellent read, but somehow it doesn't call to me in the same way as these books. Left-overs for us, surely the best part of the Christmas Feast...and we certainly won't be visiting the sales. It is a day for extra-long walks with the dog and then a guilt-free hour or two spent reading by the log fire. The older I get, the more I seem to enjoy Christmas. Simple things, like getting out the Christmas china, baubles and decorations for the tree, and some of my mother's favourite old cake decorations. My helpful Kitchen Angel - a rather large, golden, papier mache cherub - also makes an appearance. She has been watching over my festive kitchen cooking for almost twenty years and has more or less ensured that everyone is well fed and happy. Today has been a happy, pottering kind of day and I have made mince pies, shortbread, tomato and garlic bread, regular white bread, English muffins, and I have a large pan of red cabbage with cranberries and apple gently cooking in the Rayburn. I had fairy lights a-twinkling, carols and Christmas hits playing on the radio. Bah humbug! you may say, but I enjoyed it. These days we host a Christmas Day breakfast party for the family, which means that by around midday peace descends upon Parsonage Cottage. We could go out to eat with the family, but we enjoy this small oasis of peace and quiet, after years of hosting enormous Christmas Day lunches. punctuated only by the demands of the cats or the need to walk the dog. My husband will tuck into his very favourite Christmas food - turkey and piccalilli sandwiches and I will indulge in a smoked salmon sandwich - as we watch the Queen's Speech and then dip into our new books. Bliss! Merry Christmas, however you celebrate it. September 3rd was traditionally known as Nutting Day, which is when children would go out into the local woods to collect hazelnuts. Beat the butter and caster sugar together, until light and fluffy. Beat in the eggs, one at a time, adding 1 tablespoon of the flour with each egg. Stir in the ground almonds and chopped nuts with the rest of the flour. Add 1-2 tablespoons of milk, to make a soft consistency. Turn into a buttered and lined 2lb/1kg loaf tin and bake for 1 1/4/1 1/2 hours. Turn out on to a wire rack to cool slightly. Warm the apricot jam and pass through a sieve. Brush half on to the warm cake and decorate with the nuts. Brush with the remaining jam and leave to cool. The cake is light and moist, beautifully textured with the chopped nuts. Will definitely make this one again. Recipe found in A Calendar of Feasts Cattern Cakes and Lace by Julia Jones and Barbara Deer, published 1987. As well as making and baking plenty of food and cakes, this summer has also featured a bit of fun as I played around with echoing some recipe book covers. The most fiddly bit is getting things set up at the right levels, varying heights so that the photograph looks good, rather than slavishly following what is on the cover. Just go for the spirit of the cover and suddenly it becomes very easy and it is surprising just how many 'props' are to be found around the home. I hope you have had some summer fun. ps Plenty more book cover art can be found over on my Parsonage Cottage blog. 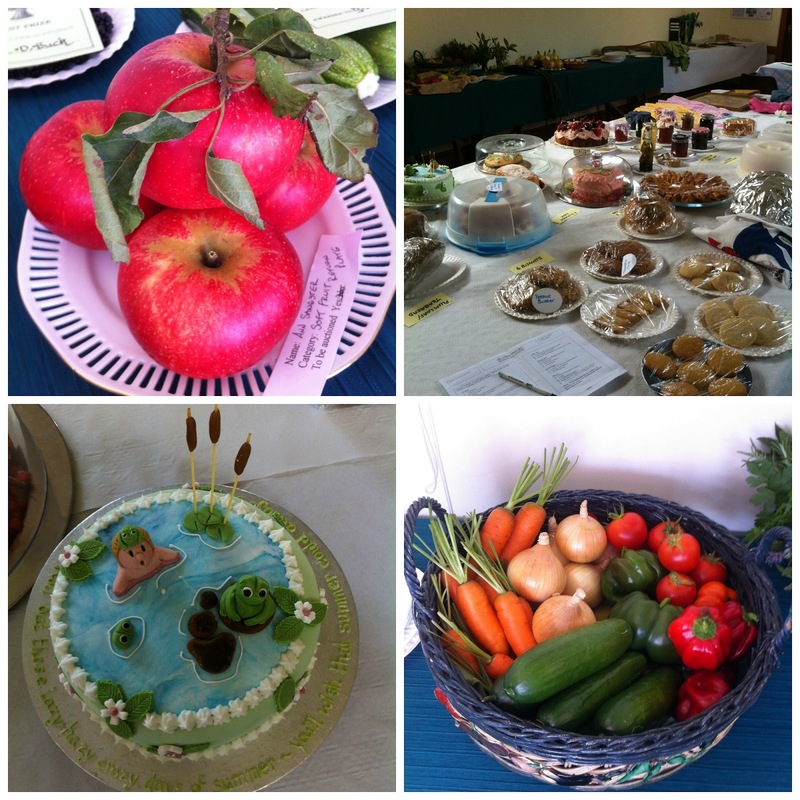 On Sunday our tiny village hall came to life for the Annual Village Show. After months of meetings and trying to generate some interest, it finally all came together and the tables were filled with fruit, vegetables, cakes, jam, pickles, craft works, photography and fabulous flower displays. It is one of those quintessentially English events where outwardly calm facades hide those deeply competitive streaks. Many of the village people have nothing to do with the event, so thank goodness we have some fabulous people who do take the time and trouble to grow, make, bake, jam, pickle and create things for the show. How much poorer our village would be without his wonderful support and participation. This year it was especially difficult to keep things going because our committee numbers are so depleted. Fortunately, on the day, several people who had not been able to help with the preparations turned out to help with the general work of selling tickets, filling in forms and helping with the refreshments. Phew! The doors were closed at 11am, the judges had arrived and they took their work very seriously indeed. Jams and pickles were tasted, salad dressings, ditto. Cakes were cut and nibbled, notes made. Bread was sawn open and prodded, poked and sampled. Judgement made, the certificates were filled in and best of category selected. By 2pm the work of judging had been completed, so had the paperwork, and the doors were opened. In rushed the crowd to scan for prizes, assess the judging, cakes and tea were consumed and raffle tickets drawn. Without events like this, which do take a lot of work, but which draw a community together, the village would be a much duller place. People come together and have fun, they sit and drink tea, chat and wait for the awards and raffle. They turned out and they participated and the hall was buzzing with conversation and fun. The tradition of the Village Show has been maintained. My collection of handwritten books. Tales from Parsonage Cottage is about my love for the Lincolnshire countryside, my village, home, animals, interests, life. These posts are simply my ramblings and mutterings. We have so many wonderful old photographs in the family albums. Unfortunately, few have their names written on them... rather like many of my old recipe books. Such a shame. I do happen to know that many of them were wonderful cooks, so here is a small selection. I think this is my maternal Grandma..
Grandma died before I was born; she was a good cook, but Grandpa was a truly wonderful one, or so my mother used to tell me. Love the hair-do! Not a cook, but she was fluent in seven languages. Alas! I don't know her name but I have always loved this photograph. Another of Grandma's sisters. I wish I knew who was who. My father's side of the family. I find those eyes a little scary.